We are in the thick of winter and some places across the country are experiencing weeks of freezing temperatures and bitter cold! At any rate, the show must go on, right? I’m excited to share with you a fun, snowy, in-doors literacy activity that your children are going to love! This Winter Sensory Bin Alphabet Match will be a winter-time favorite for matching upper and lowercase letters of the alphabet! *Pair with our Winter Centers and Activities for Pre-K/Kindergarten! These winter months can start to drag on during the school year! Adding a literacy-based sensory bin as a center can definitely liven things up. 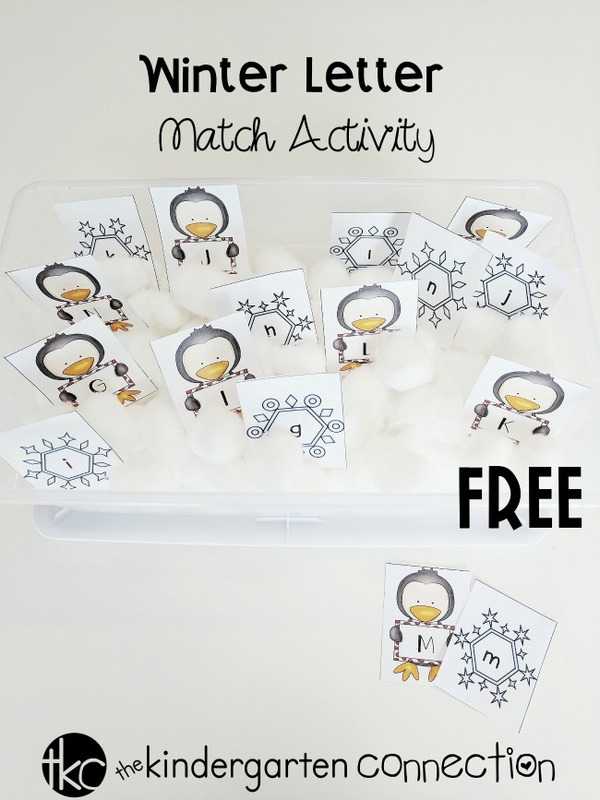 This FREE Winter Alphabet Match can be used two different ways and focuses on matching upper and lowercase letters. It is simple and there is close to no prep for you! This is perfect for introducing upper and lowercase letter matching for Pre-K students as well as review for Kindergarten students. It can be used as an independent sensory activity or as a game in a literacy center. For this activity, you will need a small bin and a bag of cotton balls. I chose a clear plastic bin with the lid attached for easy storage! I also like to laminate the cards for durability. Children can play independently or they can take turns with a small group. 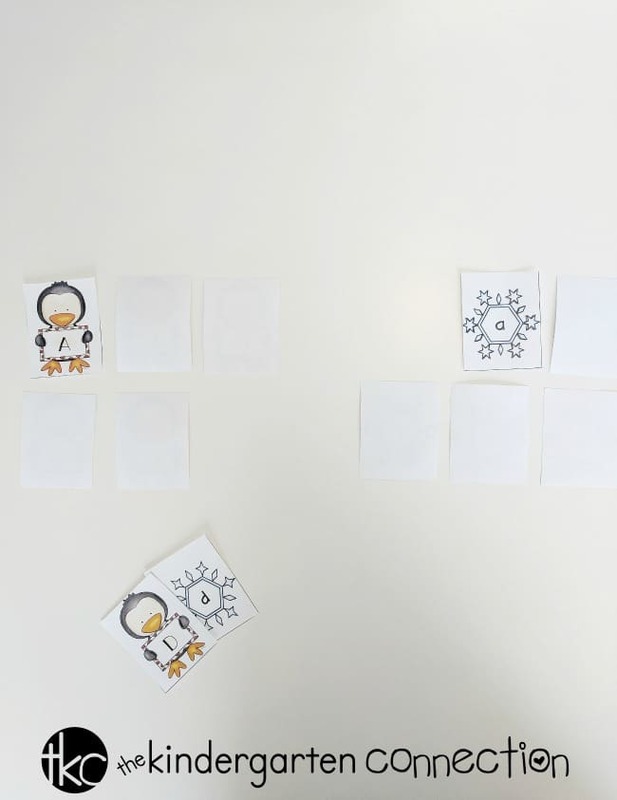 After cutting the cards apart, you will need to place the penguin and snowflake cards in the bin sticking out of the cotton balls so the letters are visible. Students can first choose one uppercase letter penguin card and then try to find the corresponding lowercase snowflake card. For the matching game, I separated the upper and lowercase letter cards into two piles. I also only place a few cards out at a time for my early learners. Children can take turns turning over one card from each pile to find a match. The player with the most matches wins! This is played like a traditional matching game. 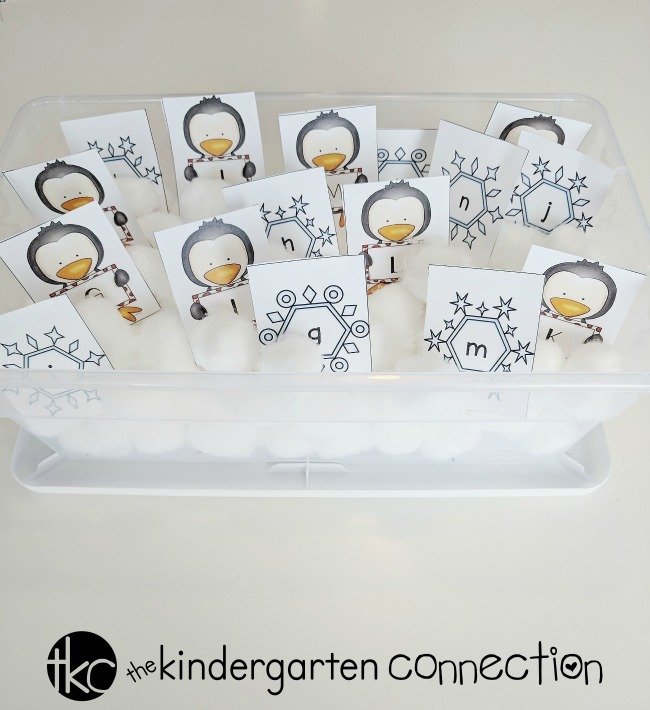 If you are ready to add some snowy fun to your literacy centers with this Winter Sensory Bin Alphabet Match printable, go ahead and click the large, yellow button below! Then, hop on over to see our Penguin Alphabet Clip Cards!